I have fond memories of air beds. Most of them involve staying up till after midnight with my friends, trying to stifle the fit of giggles we just couldn’t stop. I know now that the air beds I used to pretend to sleep on when my parents would come in to check on us were not great. Every single one had a cover that felt uncomfortable to touch. After a couple of hours, I inevitably found myself in a puddle of deflated bed – not the bouncy sensation I’d expected. However, air beds have come a long way since then. Air beds are quicker and easier than ever before and can create a guest room in no time at all – a great benefit if you don’t have a lot of space. And they’re cheaper than you think. This is a guide for what you should be looking for from a new air bed, to make sure that you get the one that’s perfect for you. I’ve also put together a useful list of the best of what’s out there, to save you the trouble. You can even buy them online. So get under the covers with your torch (I know everything’s electronic now and you’re reading this on a screen with a backlight, but humour me) and let’s talk about air beds! What size of air bed should I buy? The air beds from my youth were all single beds, but there is a huge range of sizes available. You can go right through from a single to a king-size,it’s totally dependent upon the space that you’re planning to use. You can treat your guests to luxury if you want but you shouldn’t have to stack your couch and coffee table to do it! Generally, a double is a safe option. Plenty of space for one, can accommodate a couple if you need it to. It’s a bit more versatile than a single. How long can I use an air bed for? Air beds are designed for ease but, ultimately, temporary use. They aren’t made to be used regularly for months and months. If you want an air bed for the occasional visitor, then it should last you well. You can use an air bed every night for a week or two and it’ll hold up fine. However, it isn’t ideal as a long-term solution. You’d actually be better value just getting a cheap mattress and putting it on the floor! If you’re stuck for a mattress, this is a guide I wrote for buying a budget-friendly option, which will serve you a bit better than an air bed. What should I look for if I’m buying an air bed? Comfort and feel are important, you want to make sure that it’s nice to the touch. I am no stranger to having friends to stay, talking to the wee hours and then remembering with a groan that the air bed still needs pumped up. My friends are my guests, I can’t really make them do it. So I end up stomping a squeaky foot pump, to the hilarity of everyone else. An electric pump eliminates this entire scenario! You can just plug it in and watch it breathe life into your air bed, from the comfort of anywhere but stomping a foot pump. Now that you have an idea of what you want, here are the best air beds available. They are organised by size, from smallest to largest, so you can easily find what you’re after. Each air bed has a short review, the price and a link to where you can buy it online. 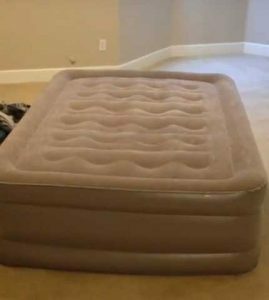 If you have any questions about which air bed is right for you, don’t hesitate to ask me in the comments section at the bottom of this post. I’m an expert, after all! This air bed is the epitome of convenience. It rolls itself out, pumps itself up and is good to go! If only other things in life could be so easy. As the name suggests, this air bed is tall – about 47cm when it’s inflated. This means that you’ll get a better sleep, since you won’t feel as if you’re touching the ground. Just make sure you close the plastic valve before going to sleep, or it’ll deflate! Despite being tall, it folds up neatly into a carry bag. You’ll be able to pack it away in a cupboard when you’re not using it and it won’t take up too much room. We’ve all been there. You’ve gone to sleep on your air bed for the night, wrapped up in your sleeping bag. Then you wake up in the morning halfway across the room on the floor. One of the great things about this air bed is the raised edge that runs round the whole thing. It’s designed to stop you from rolling out, giving you a more comfortable sleep. Even if you aren’t prone to falling out of bed, it keeps your pillows from slipping off the end – something I hate when I’m on an air bed. There’s also a little pocket on one side, so if you’re someone who has to have their phone on them at all times, you have somewhere safe to keep it. This air bed also has a lovely foam top which creates the impression that you’re on a regular mattress rather than an air bed. Super comfortable! Aerobeds are one-of-a-kind. They are unrivalled when it comes to convenience and comfort. It has an electric pump built in and inflates in under three minutes. It also deflates completely flat, which makes it so much easier to put away. It comes with a carry bag too, so you really have everything you need! Like the Parkland air bed, this one is also tall – a whopping 56cm – and you really notice the difference. It’s made up of two sections: the divan and the mattress, which inflate at the same time. It’s incredibly comfortable and has had great reviews from elderly customers with conditions like arthritis. It’s undoubtedly one of the best air beds available but it does come with a hefty price tag. If it’s within your budget, then you absolutely get what you pay for. This air bed is a bit different to the others I’ve talked about because it sits on a frame. This makes it a little more luxurious and falls in that middle ground between air bed and actual bed. If you’re looking to keep your air bed longer-term, this is a better option, since it’s more robust. However, if you’re worried about space, this air bed still packs up into a carry case, so it’s not going to take up lots of room. The mattress inflates in less than two minutes and it’s incredibly easy to use. 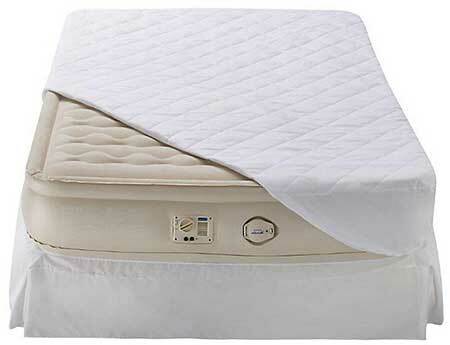 Unzip the case, turn on the pump and as the mattress inflates it pushes the frame into shape. Just make sure you have enough space before it all pops open! I know what you’re thinking. 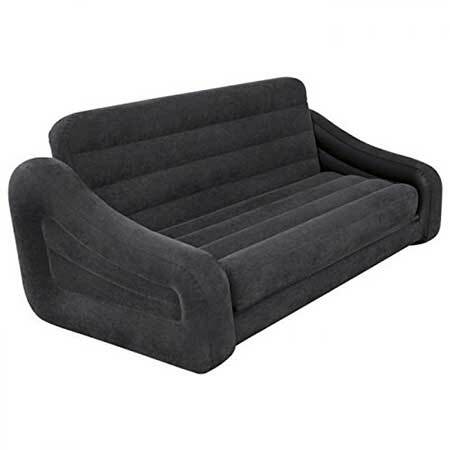 Inflatable sofas haven’t been in style since 1995. This is a great option if you’re looking for an air bed for kids, since it can be used as a sofa and a bed. And an adult would probably struggle to get comfortable on this one. The backrest lifts off and then the mattress can be folded out, it’s really simple. The only downside to this air bed is that it doesn’t have the all important electric pump, so if you wanted one, you would need to buy it separately. 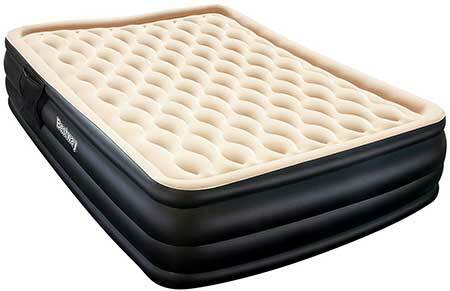 This is a great all-rounder air bed. It has plenty of room to sleep two people, it’s very comfortable and comes with an electric pump. The pump is built in to the bed and the mattress will inflate in around three minutes. If you prefer a firmer mattress, there’s even an option to inflate it for another two. This is anothertall air bed – 50cm – and even with all that height, it still stays inflated all night long. No sore backs! However, this one doesn’t come with a storage bag. I know I struggle if I have to try and fold an air bed to put it back in the box it came in, so this is something to be aware of. Should I get a puncture repair kit? I’d say that it’s always worth having. You don’t want to be stuck without one! All of the air beds that I’ve talked about come with puncture repair kits but if you’re going for something different, remember to check whether or not a kit is included. The pump is so loud! Is there anything quieter? Afraid not! It’s the price you pay for not pumping air beds up by hand. Or foot. Am I going to be too heavy for an air bed? Air beds can hold anywhere from 200-300kg, so even with two people on there, you should be just fine. I’m still stumped. What now? If you’re not sure, feel free to leave me a comment in the box below and I’ll be able to help you out. In need an inflatable double mattress with a width between 121cm and 132 cm. I haven’t been able to find one online, do you know of any? I’m afraid I don’t, the closest I found was 137 cm, I’ll keep looking and let you know here if I find anything.